School has officially started back in our area and fall it right around the corner. Though with the hot temperatures and high humidity, you might not believe it. Last week, quilting wise, ended up being a bust for me. Not much got finished, with after school meetings and band practices to pick my daughter up from. It's okay, though, we will eventually slide back into our rhythm and things will return to normal. Warning: this post may jump around quite a bit...much like my week last week. 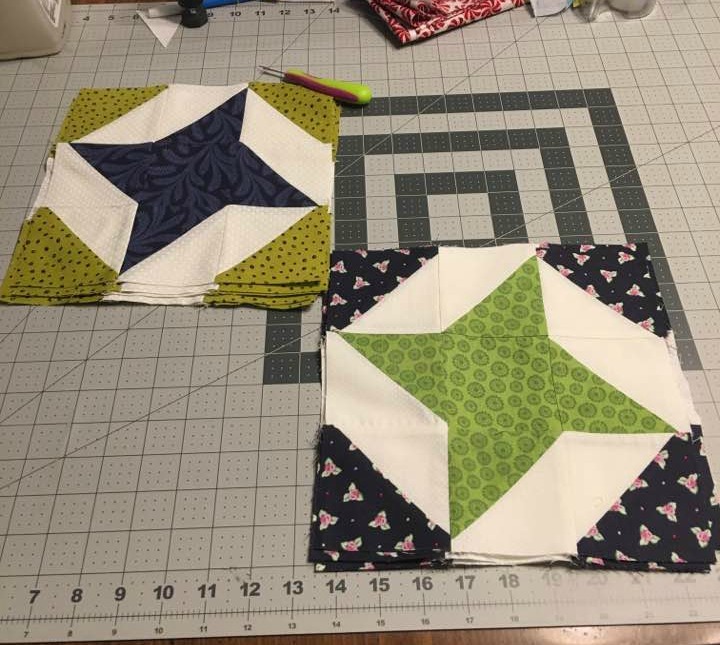 One of my main goals last week was to piece together the blocks in Lorna at Sew Fresh Quilt's Have a Jolly Little Christmas Quilt. I had all my sashing strips cut and little by little each evening the blocks came together. The finished size of the blocks with sashing was 42"x68", which seemed an odd size to me (very long and skinny), so I decided to add two borders to the quilt. The addition of the inner and outer borders bring the quilt's size to 58"x84", which should make for a cozy quilt to snuggle under while watching Christmas movies. You might remember that I'm working on a secret birthday project for my daughter, using one of Lorna's newest patterns. I can only work on the project on Tuesdays and Thursdays for about an hour while my daughter is at after school band practice. It's coming along slowly, but the center is almost complete. I've deiced I would also like to make it bigger by adding a fun border. So this weekend, David and I traveled to Classic Quilt Shop in Clarksburg, WV for a little family fabric shopping. We absolutely love visiting this store and chatting with Janet, the owner. 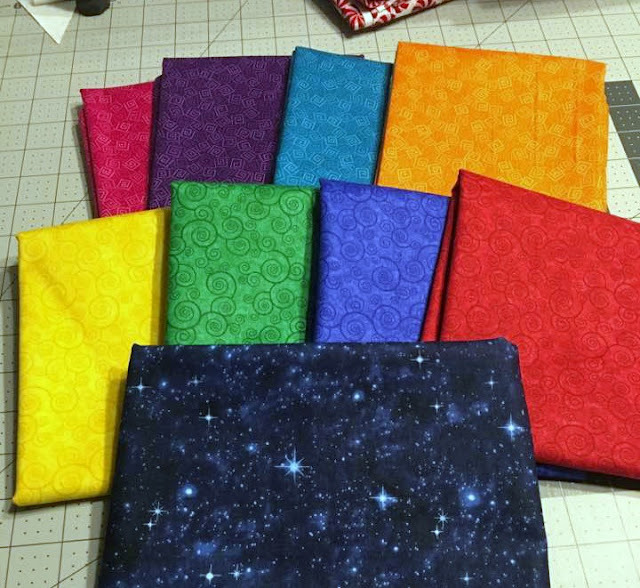 I was able to pick up a beautiful rainbow of fabrics that will become a fun border on Jen's quilt and a really cool binding fabric that looks like a clear starry night. I can't wait to cut in to these pretties. Next up is the guild block exchange. In November, those of us participating, will bring sets of five of the Spinning Friendship Block. I think I will do 7 sets of 5 blocks which will give me a total of 35 to work with in a quilt top. I am sewing my block pieces as leader/enders while I piece together other projects. This method is working well for me. I've already whipped up two sets of five. Recently, David and I have had a few people ask if they could commission us to make a quilt. I'll be honest, I'm not necessarily crazy about the idea. It makes me nervous. 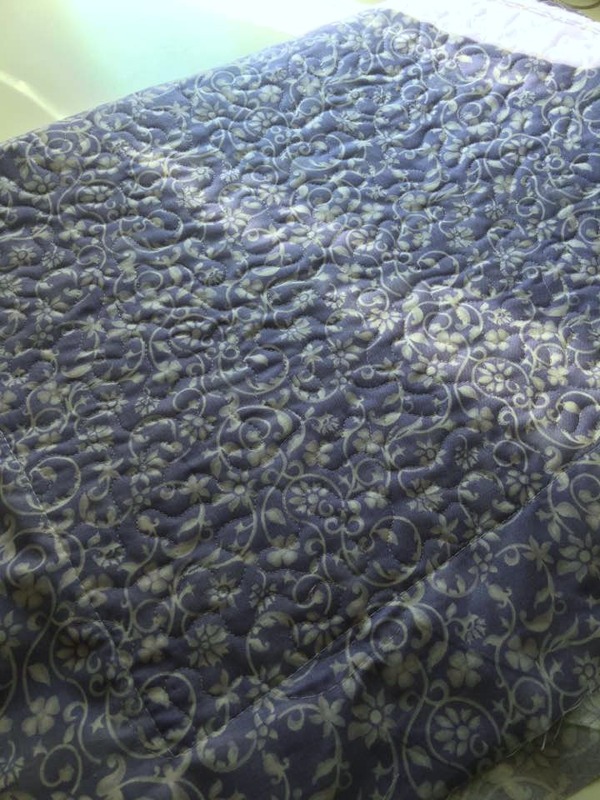 How do you price someone a quilt, without making it first? Another great question, can you bring their vision to life, if they don't know exactly how to communicate it to you? Of course, David said yes to them. The first quilt will be a larger one (it's actually pieced and waiting for me to quilt it) and he agreed to the commitment before a price was settled on. The second was for a baby quilt. The person really had no preference other than he wanted dark greens and purples and could we keep it around $100. So I created a spread sheet to estimate cost and mocked up a few designs for him to choose from. This weekend, we were able to complete the small quilt from start to finish. I will share more about his later this week and how I landed on a price. So I'm curious, do you make quilts for others and how do you settle on a price? Do you have any tips on how to make the whole process smoother? be good...Santa is always watching. Today I'm linking up with Main Crush Monday and Let's Bee Social. Lovely spinning blocks. And pricing, when Hugh was doing woodwork items, that was the hardest part of all. I know long arm quilters divide it up into basting, loading, quilting, and adding up the hours it takes. And when a whole quilt price comes to the $400 or more in NZ dollars, those hours are all there for the owner to see. Your Christmas quilt is lovely! I am no help with pricing, I'm not sure where I would even begin. I thin 'thebiasedge's idea to check out Etsy for pricing is a good one. However, a lot of people undervalue their pieces on Etsy. You have to decide whether you merely want to cover the cost or whether you want to make a small profit too. Consider material prices, cost of each of your work hours including the ones you spent on design, utilities, electricity, and profit on top. Let's face it a full twin sized quilt cannot cost a mere 100 Dollars, more like between 350 and 450$. Maybe check out the quilt sales pages of people who frequently sell quilts, i.e. haptic lab, Rachel Hauser at Stitched in Color and others. It's difficult to believe it's back to school already! We wait so patiently for summer to arrive, then, in the blink of an eye, it's passed us by! Enjoyed seeing your Christmas quilt all put together. Can't wait to see the others you've been working on! I love having leader/Enders projects. It's amazing what can be accomplished using that technique! You are always so busy...how the heck do you do that?! I've got endless hours these days to quilt, yet I don't have the desire just yet. Slowly I'm working my way back! Pricing a quilt isn't easy and it is true that we usually under value them. It can depend on the design, quilting, fabric and size. I'm curious on seeing your secret daughter quilt!! So, you have a Christmas quilt flimsy completed in August and you want to whine about not being able to do more??? Please have mercy on our quilting souls who still must work 40 hours a week. Love the saturated colors for Jen's quilt. Hope she does not read your blog. Yes, I have made quilts for others. A baby quilt (40 inches square)is $150 (more/less depending on the complexity of the pattern). If they want to pay less, I suggest a simpler pattern. Congratulations on getting one QAL quilt top pieced! That must feel great! I am excited for the secret quilt you are making your daughter; those are a lovely grouping of fabrics you picked up. As for commissioned quilts... I am up front about how much I change per hour of my time (including the design back and forth time!!) and materials costs. Right now I have purposefully raised my hourly rate high enough that not many people are interested in working with me. It can definitely be a challenge to meet uncommunicated expectations. Lovely Christmas quilt. And good for you for getting it done. As for pricing quilting -- ugh. I've been making some quilts from blocks or unfinished tops for a friend. I don't charge her a lot as I know her and she let's me do stuff at my very slow speed. But I do long arm quilt for others. Most everyone I've ever had contact with on long arming for a business charge by the square inch. The price varies based on 1) your location -- some areas can't or don't charge as much as other areas. 2) The complexity and density of the pattern. 3) Thread choice 4) Add ons like trimming, applying binding, hand stitching the binding. Actually the long arming part is so much easier and straight forward than the piecing. I agree with Preeti's comment about her price. Good luck and share what you decide. What a great quilt! You will be thrilled at the end of the year when you have a new Christmas quilt and you don't have to do anything but enjoy it. Love those fabrics you've picked out, too. As for pricing, I would look around at how others have priced similar-sized quilts and use that average as a guideline. Good luck! I'm so far behind in the Christmas QAL. But it's not Christmas yet, so I have lots of time. ha ha ha I love those new prints. Love your holiday sampler! I've enjoyed seeing your blocks and Lorna's patterns. I had a coworker ask about commissioning a quilt once, but I turned her down before we could even begin a discussion about price. I just don't get much sewing time and I didn't want to spend it working on what someone else picked out, even though I do give away most of what I make. And we all know that non-quilters have no idea of the cost of materials alone that go into a quilt, not to mention labor. I just didn't want to deal with it, truth be told. Of course you know I am thrilled to see your Christmas quilt top... Love the addition of the borders. Thank you so much for quilting along! I try to avoid making commission quilts. Those non-quilters just don't realize how much it costs for fabric and they certainly don't understand how much time and energy and care goes into the making. Our kids still have one week of summer vacation left to go. I used to loath having a routine when I was a non-quilter, but now I look forward to the time alone!